This advice from the owned archetype, Abundance, was written with my non-dominant or "other" hand. These dialogues, taken from my journal, were created using a method described in Lucia Capacchione's book, The Power of Your Other Hand. A question was written with the dominant hand and the archetype (owned or disowned) answered with the non-dominant or "other" hand. 2. Advice from Abundance “Dialogue with your inner wisdom. 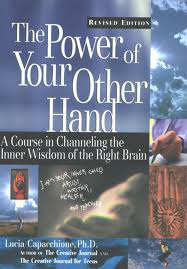 You may ask for advice from your 'inner wisdom' and answer by writing with your other hand." 3. Lucia Capacchione: The Creative Journal Method & Visioning "The non-dominant hand has a very magical way of accessing … the emotional centres – creative, intuitive and spiritual." Used with permission via luciac.com.